Time of Origin: No planet of origin; reached Earth in 1971. Appearances: "The Claws of Axos", "The Feast of Axos" and "The Golden Ones"
Companions: The Brigadier, Sergeant Benton, Jo Grant and Captain Mike Yates, Evelyn Smythe, Thomas Brewster and Amy Pond. History: Axos may very well be one of the strangest and most ruthless creatures The Doctor has ever faced. Although capable of manifesting independent forms, ranging from golden humanoids to misshapen masses of flesh, Axos is in reality a single entity, its main form being that of an apparently smooth golden-coloured ship. Described by The Doctor as ‘cosmic bacteria’ - although Axos described itself as simply hastening the natural process of death - they travel from world to world, devouring all of the planet’s natural resources by posing as a benevolent species offering the powering element Axonite, capable of apparently absorbing, converting, transmitting and programming all forms of energy. In reality, of course, Axonite’s purpose was quite different; it facilitated Axos’s feeding patterns by being distributed across the planet, thus making it easier for them to absorb the maximum nutrient value from their latest conquest. Axos was even capable of basic time travel, although it was currently only capable of moving a few seconds backwards and forwards in time, allowing Axos to, for example, escape being struck by missiles by jumping forward in time for the seconds it would take the missiles to reach and pass through their current location. Axos was eventually drawn to Earth when, under unrevealed circumstances, they managed to capture The Master, The Master providing them with the location of Earth and the promise of offering them the secret of time travel - which would allow Axos to expand its feeding range to extend into the past and future - in exchange for his life. Having reached Earth, Axos posed as the seemingly benevolent Axons, offering Earth Axonite in exchange for a new home, claiming that their home system had been crippled by solar flares. Although The Doctor was automatically suspicious of the offer, his suspicion was initially somewhat tempered by his own personal interest in Axonite, speculating that it might provide the energy he needed to get the TARDIS working after the Time Lords had exiled him to Earth. Despite the actions of arrogant civil servant Chinn, who had been sent by the Ministry of Defence to monitor UNIT and now sought to acquire Axonite for Britain’s exclusive use, The Doctor eventually learned of Axos’s true nature after Bill Filer - a CIA agent sent to UNIT with reports about possible locations for The Master - managed to infiltrate and escape Axos with the aid of The Master. Although Axos managed to capture The Doctor and Jo Grant, torturing Jo in order to force The Doctor to give them the information they sought about time travel, The Master was able to partially destabilise Axos by feeding the power of the nearby Nuton nuclear power plant - which Axos had been attempting to drain to gain the necessary energy for time travel - at a more rapid rate than they were expecting, but failed to destroy it… and, to make matters worse, the UN had learned of Axos’s offer and were demanding the immediate mass distribution of Axonite. With no other way to defeat Axos, The Doctor was resort to a dangerous bluff in order to save Earth. Having convinced The Master that he had no wish to die on Earth, he was able to win his enemy’s support in getting the TARDIS operational again, subsequently travelling to Axos itself and offering to link the TARDIS to Axos, granting Axos complete power of time travel if they agreed to help him destroy Gallifrey in revenge for exiling him. However, as soon as the TARDIS had been connected up to Axos, The Doctor tricked them by sending Axos into a time loop, only just managing to escape the loop himself. With Axos trapped in a time loop, its various ‘extensions’ were drawn back to itself, ending their attack on Earth and condemning them to relive the same few seconds of history over and over again, unable to escape. Axos returned to threaten Earth in the mid-twenty-first century, when the UK spaceship Windermere, on behalf of billionaire Campbell Irons, broke through the time barrier around it, believing that he could use the revived Axos to solve the world’s energy crisis by threatening to set off a nuclear device if they refused to help him. Alerted to the danger of the returning Axos, the Sixth Doctor, Evelyn Smythe and Thomas Brewster attempted to investigate, but the TARDIS’s arrival provided Axos with enough power to begin its schemes for revenge against Earth, offering Brewster the TARDIS if he agreed to act as their spokesperson. With Axos having absorbed Windermere to negate the threat it posed, it also gained the ability to absorb energy from Earth by converting the microwave transmitter that would have sent energy from Axos to Earth into a receiver to do the opposite, absorbing Mission Control and Campbell Irons while sowing discord among The Doctor and his companions by editing conversations to give the impression that The Doctor didn’t care what happened to Brewster. Fortunately, the intervention of the Jules Verne, a rival Eurozone spaceship, gave the TARDIS and Windermere crews a chance to fight back, just as The Doctor discovered that Axos had created a duplicate of himself as part of their efforts to escape the time loop for good. 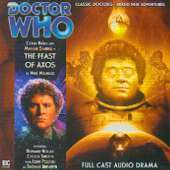 Axos tried to get the Jules Verne in range of the microwave transmitter so that it could absorb their energy, but Evelyn managed to divert the Jules Verne to avoid Axos, leaving Axos to threaten to absorb Brewster if he didn’t give them access to the TARDIS. Although Brewster stole The Doctor’s TARDIS key and gave it to the duplicate Doctor in time for them to escape the time loop, he was able to trip Axos by helping The Doctor access the TARDIS’s Fast Return Switch, sending Axos back into the time loop just as the Windermere’s nuclear device went off, leaving Axos trapped in the moment of its own destruction, the duplicate Doctor dying as he was cut off from Axos. Despite its apparent destruction, Axos returned once again when it was released by the enigmatic Chiyoko, infiltrating 21st century Japan by disguising themselves as humans and producing a new television programme intended to promote a new soft drink that would turn the children who drank it into Axons. Using the children as leverage, Axos convinced the mayor of Tokyo to send it power from a nearby nuclear plant, claiming they only needed enough power to leave, subsequently using the energy to transform into a giant monster, aiming to begin a new feeding cycle. The Eleventh Doctor was able to defeat Axos by having the citizens of Tokyo turn on all of their electrical appliances, drawing the plant's energies away from Axos, starving and eventually killing it ("The Golden Ones"). The Doctor later learned that Chiyoko had released Axos with the goal of ensuring her own creation, as she was a unique hybrid of human, Shasarak, Axos and TARDIS, with The Doctor managing to avert the timeline that led to her creation as it would have also resulted in humanity's extinction ("The Child of Time"). Since this encounter takes place before the Sixth Doctor's encounter with it from the perspective of the rest of the universe, the most likely explanation is that Chiyoko only released a fragment of Axos rather than the complete entity, with its complex nature allowing it to be parted without suffering any significant weakness and the prime fragment remaining trapped to be destroyed by the Sixth Doctor later.